other information Rounder CD 1742, 1998. Reissue of Columbia KL 4941, 1955, which was vol. 2 of Columbia World Library of Folk and Primitive Music, produced by Alan Lomax. 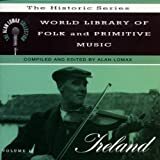 "Recorded in 1951 in the western counties of Éire." Notes by Nicholas Carolan, Robin Roberts, Alan Lomax, and Seamus Ennis. Note that the printed track contents are not synchronized with the actual track numbers. Performer: Maire O'Sullivan / Máire Ní Shúilleabháin. 28 1 Song Raibh Tú ag an gCarraig?